This large size leptocephalus must be a species of Muraenidae (moray eels), and probably the larva of a long thin ribbon eel, which is metamorphosing, not feeding, and is entering shallow water to finish metamorphosis into a young eel. 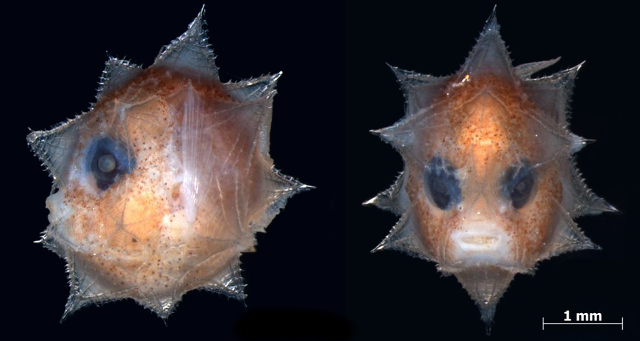 (Larva identified by Michael J.
Eels offer one of the strangest examples for how to build a baby fish. The diverse Order Anguilliformes shares a remarkable developmental stage known as a leptocephalus, which, at its most extreme, produces a perfectly transparent swimming ribbon, as seen in the video above. 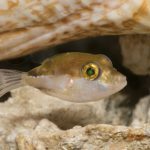 This peculiar larva is also common to several other groups of “primitive” fishes, including the decidedly non-eel bonefishes, ladyfishes, and tarpon. 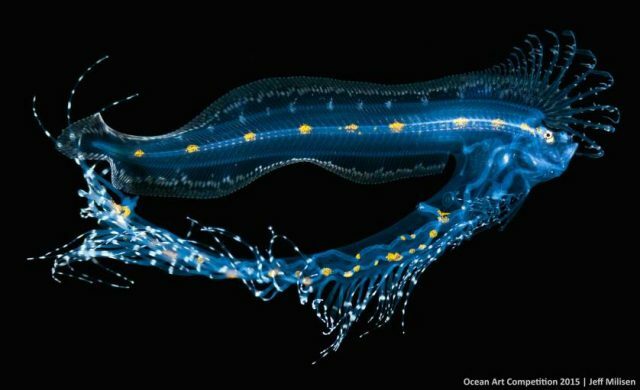 When first discovered, these transparent creatures were described as their own genus (Leptocephalus), and when it was eventually determined that they developed into eels, it was suggested that the largest specimens (said to measure 1.8 meters) might eventually grow into a 30 meter adult eel. Sadly, there are no eels this large. 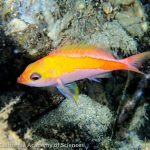 Ribbonfishes (Trachipteridae) are not a familiar group, as these fishes are rarely encountered and typically occur far from shore, though every so often a small specimen finds its way into an aquarium store were it inevitably perishes. They are close relatives to the famous Oarfish, and, while perhaps not quite so extravagant as that species, the larva of Trachipterus is certainly a stunning animal as it wisps its way through the water. Here is a Liopropoma larvae being raised by Todd Gardner at The Long Island Aquarium. Juvenile basslets are another stunner, sporting a series of buoyant modifications to the dorsal fin. Todd Gardner succeeded in growing these delicate looking beasts, which wound up being Swissguard Basslets. It’s a shame they can’t keep their ornate coiffure, as a Candy Basslet would look quite fetching with this little flotation device. 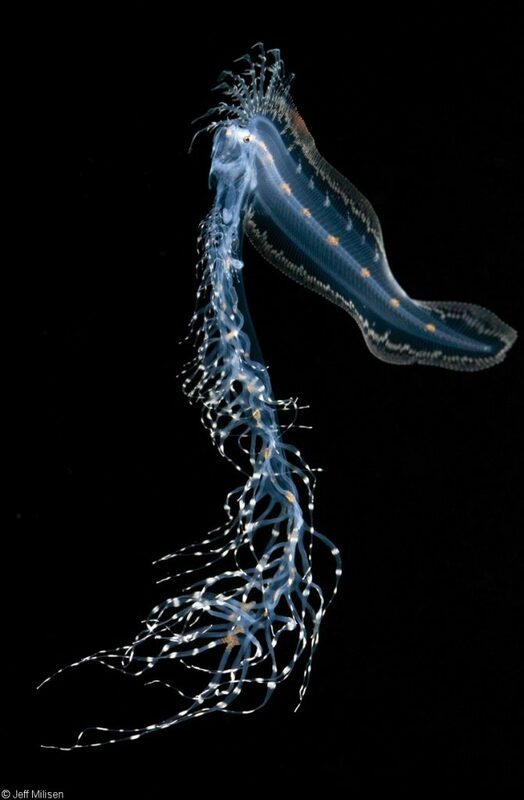 One of the more obscure fishes in the sea are the Jellynoses of the Family Ateleopodidae. These deepwater denizens are aptly named, as their head (as well as their body) is highly gelatinous in its composition. 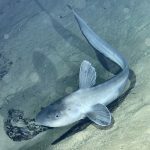 With adults capable of reaching two meters in length, these are some of the larger fishes found in the deep, and the limp body can be seen as an adaptation that allows them to grow to such immensity with the limited nutrients available to it. 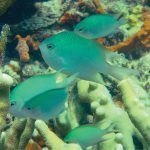 This group has long had a confused position in the grander scheme of fish evolution, but recent studies have solidified a place for it as an isolated lineage sister to the more advanced fishes (Neoteleostei). 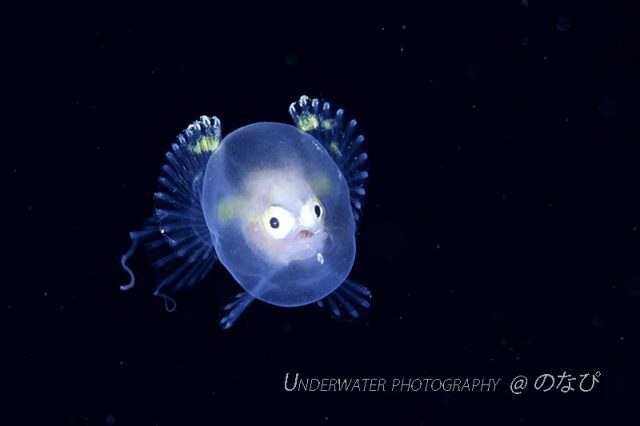 This curious swimming sphere was identified by its photographer as a juvenile batfish of the Family Ogcocephalidae. 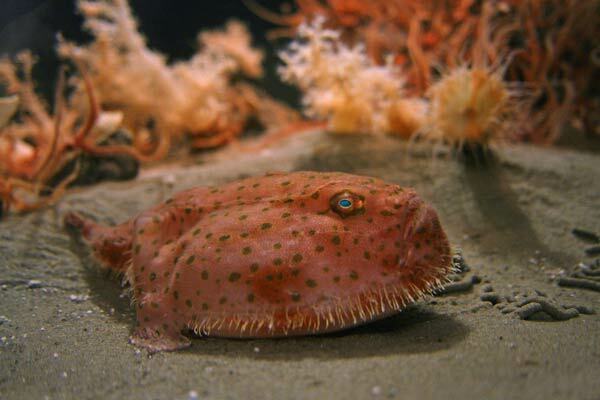 Adults are flattened bottom-dwellers that perch upon modified feet-like pelvic fins and can occasionally be had in aquarium stores. 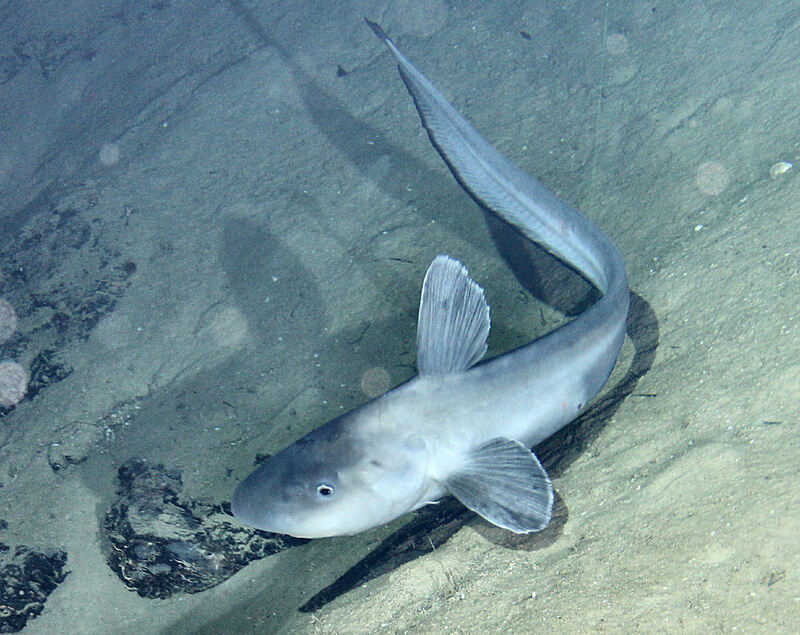 This particular specimen might be the common shallow-water Ogcocephalus or a deeperwater form like Chaunax. 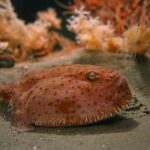 Related to this group are the shallow-water anglerfishes found on coral reefs, as well as the delectable monkfish, all of which have the curiously modified dorsal fin which acts as a fishing lure. 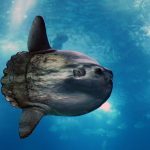 If there is any one fish which looks the least like the adult of its species, it may be the young of the Ocean Sunfish. 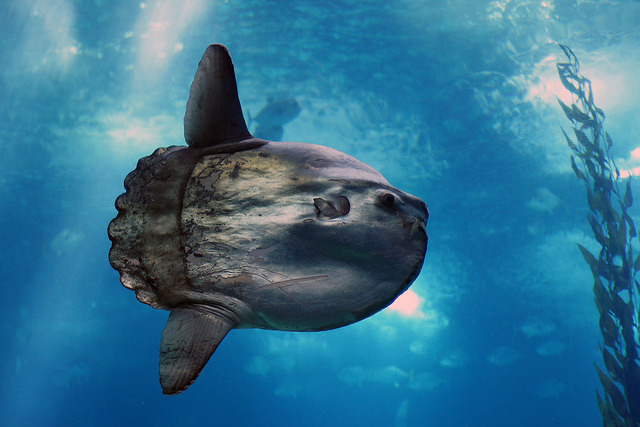 Adults are enormous relatives of pufferfishes and triggerfishes which can grow to 14 feet across the fins and weigh 5,000 lbs—which is officially, scientifically, stupid big. The juveniles, however, are a very different affair, looking more like a grain of pollen than anything piscine. 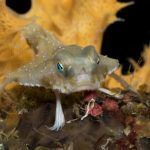 Perhaps the most remarkable thing about this fish is that it is able to grow to its immense proportions on a diet comprised almost entirely of jellies. Also, females lay 300 million eggs at a time, which goes to show just how few of these spiky little juveniles survive into adulthood. 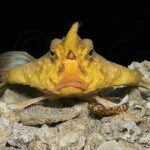 My vote for strangest fish larva goes to Lamprogrammus, whose long ribbon-like bodies are adorned in bright yellow spots, with an ostentatious crest of enlarged fin rays above the head. And, for good measure, there is an utterly bizarre frilled pouch housing the gastrointestinal system which bifurcates to form a dangling lobe that’s longer than the actual fish.